PREMIUMS for sound Australian wool of consistent length helped maintain benchmark price levels at auctions this week. 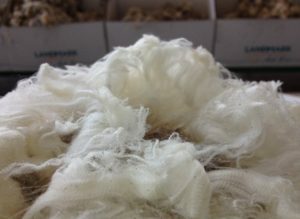 AWEX senior market analyst Lionel Plunkett said as in recent sales, it was wool possessing favourable additional measurements, in particular lines with low cvh readings (under 50 percent in length variation) that attracted the greatest attention. “As these types are in short supply, they recorded the largest increases for the series and were a major factor in many of the individual Micron Price Guides (MPGs) posting positive movements,’ he said. Mr Plunkett said the AWEX Eastern Market Indicator added 4 cents for the sale, to close at 1927 cents/kg clean. “In a solid start to the calendar year, in the first three sales of 2019, the EMI I has increased by 48, 13 and 4 cents respectively. “The EMI has now risen for four consecutive weeks, since gaining 13 cents in the final sale of 2018,” he said. Mr Plunkett said the smaller selection of 41,757 bales, 9946 bales fewer than last week, attracted strong demand, helping to push prices upward. Brokers passed in 9.6pc of the bales offered. “Wool 26 micron and finer lacked buyer support and recorded losses of 30 to 40 cents. “The broader range of 30 to 32 micron attracted good demand, resulting in general price rises of 10 to 20 cents,” he said. “The oddment market experienced losses this week. Australian Wool Innovation’s weekly market report said buyer sentiment was somewhat hard to gauge this week. “Trading exporters appeared to be either keeping opinions tightly to themselves or they are trying to operate within an unknown environment as to the immediate prospects of wool price and demand that is in play. “The latter appears to be more likely,” AWI said. “With prices at historically high levels, the risk appetite of buyers remains very low, so speculative stock taking is practically nil. “The known holding and financial cost burdens outstrip any potential profit given a gamble of an upward market movement pays off and an assured substantial loss given the opposite movement occurs,” AWI said. AWI said it also seems that Australia’s manufacturing destinations are also facing the same “unknowns” further upstream, as the indent operators or mill buyer representatives are back to dominating buyer’s lists. “These operators are generally an extension of the “just in time” or “hand to mouth” delivery mechanism of wool to first stage manufacture that has been engaged since wool prices went on the bull run of the past four or five years. “The week or two of the local traders’ enthusiasm appears to have waned, with just the largest remaining competitive at the top,” AWI said. AWI said the continuing drought is increasing its impact on the quality of the wools being offered. “A dearth of Merino types finer than 18.5 micron is prevalent and the most unusual occurrence of large volumes of crossbred wools between 23 and 27 micron being offered. The price gap between Merino qualities seems to be stable, while the crossbreds are continually changing daily trying to find comfortable levels of trade, AWI said. “Perhaps the most consistent season-long demand has centred around the European super fine types (finer than 18.5 micron). “Within this micron price range and published quotes, the values of these wools are somewhat hidden as they are both low in volume available and also so far ahead in price and specifications they are most likely excluded,” AWI said. There are currently 40,629 bales listed to be offered in Sydney, Melbourne and Fremantle next week. “With the market a little jittery towards the close, we hope that prices hold onto their levels so that China can go into their New Year in a positive mode,’ AWI said.